If you’re looking for a quick dish for brunch this weekend, you can end your search here. It’s inexpensive, satisfying, and simple to make; you can even make it the night before. 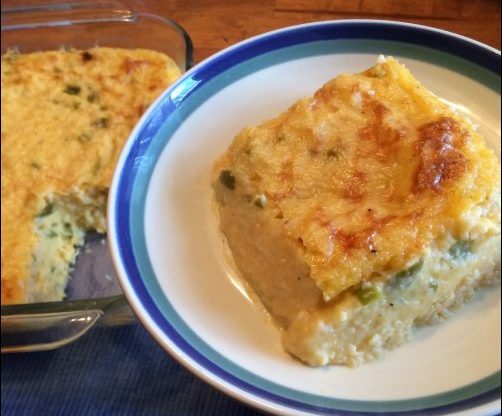 Creamy grits, eggs, and cheese come together with fresh, roasted green chiles, to make a proven crowd-pleaser with a little kick. This recipe will serve 9, for 225 calories each. Apart from the flavor, the best part thing about this dish is that it’s less than $1.50 per serving. First, you need to roast your chiles. Put them in the oven at 500 and roast them until the skins are completely charred. You’ll want to turn them a couple times to get them roasted evenly. Set them aside until they are cool enough to handle, then peel off the skins and remove the stem and seeds. I chose to dice one pepper in larger, 1/2-inch squares and finely mince the other so I have a variety of texture and heat throughout the casserole. Turn the oven down to 350. While you’re chopping your peppers, set the chicken broth to boil. Once boiling, stir in the grits, lower the heat to medium-low, and cover. Cook for 5-6 minutes, stirring occasionally to prevent sticking, until the broth is absorbed. Remove the pot from the heat and stir in the cheese, butter, and chiles. Next, mix about 1/2 cup of the grits mixture into your beaten eggs, stirring constantly. This is tempering the eggs so when you pour them into the hot grits, you don’t end up with a lump of scrambled egg. Slowly stir the tempered eggs into the grits until combined thoroughly. Pour into a greased 8×8-inch, or 2-quart baking dish and bake for 25-30 minutes, until just set; it will seem just a little jiggly in the center. At this point, I like to set it under the broiler for 5 minutes or so to get the top nice and browned. Allow to sit for at least 5-10 minutes before serving.